How do you prefer to eat your fish and chips? Once named “the good companions” by Winston Churchill, fish and chips has been a staple of British cuisine for more than 150 years. The dish isn’t hard to find, as there are eight chippies for every branch of McDonald’s in Britain. Just as the neon sign of an American fast food restaurant glows after dark, the local chippie is open late to ensure locals and travelers can enjoy their helping of flaky fried fish and salty chips at all hours. Whether you prefer yours with salt, vinegar, or mushy peas — no one can resist the classic combination. The epic duo goes back as far as the 17th century, to either Belgium or France. The chip is said to have been invented as a substitute for the fish when the river froze over and the food was scarce. Resourceful chefs would cut potatoes into the shape of fish, and fry it for the evening meal. It was around this time that Jewish refugees from Portugal introduced fried fish. It’s believed that the first “chippie” was started by John Lees. He ran it out of a wooden hut at Mossley market in industrial Lancashire. 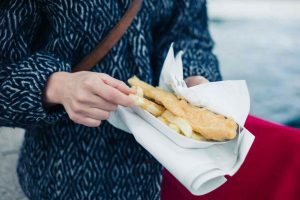 It turns out that wrapping a meal in a newspaper isn’t the most hygienic practice, which is why you won’t see any chippies serving their fish and chips in that style. Instead, the British meal is served on a styrofoam tray or a cardboard restaurant box. You’re handed a tiny wooden fork and pointed towards a table equipped with malt vinegar and salt. The comically small fork serves as symbolic encouragement to use your hands, which is why you’ll find ample napkins throughout the establishment. Enjoy with a strong tea, light beer, or your favorite carbonated soda drink. You’ll need something fizzy to cut through the greasy, delectable, magical meal. This entry was posted on Wednesday, April 12th, 2017	at 12:32 pm	. You can follow any responses to this entry through the RSS 2.0	feed. Both comments and pings are currently closed.